Alec Roberts at the Althorpe Street industrial estate. Business owners in an Old Town industrial estate have spoken out against plans to demolish their premises to make way for major redevelopment including flats for about 270 students. Althorpe Street Developments Ltd’s plans to construct three large buildings for student accommodation and employment, as well as open space for the public in Althorpe Street were revealed in May. 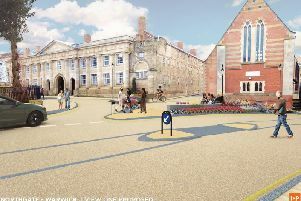 CGI of the proposed Althorpe Street development. They have now been submitted to Warwick District Council’s planning department to be considered by the authority’s planning committee. But people who live near the street, or who work at or own businesses at the Althorpe industrial estate are concerned about the effect this will have on them and the area. Labour Party campaigner and Old Town resident Alec Roberts said: ““I both live and work very close to the area affected and have spoken to local residents, and some of the businesses and workers who would be affected. “The vast majority of those who I have spoken to are against the plans. “These plans in an area already saturated with student accommodation is not what Old Town needs. “There are so few industrial units locally of similar size and rents, around Leamington, that some of the businesses have said they probably would have to close if forced to leave by their landlords. “The loss of these businesses and the jobs they provide is surely reason enough to oppose these plans. Jessica Mallorie owns Art Group Studios in Althorpe Street which holds arts classes for more than 250 people and has 12 employees. She said the majority of businesses in the area did not own their premises and would not find it easy to relocate.